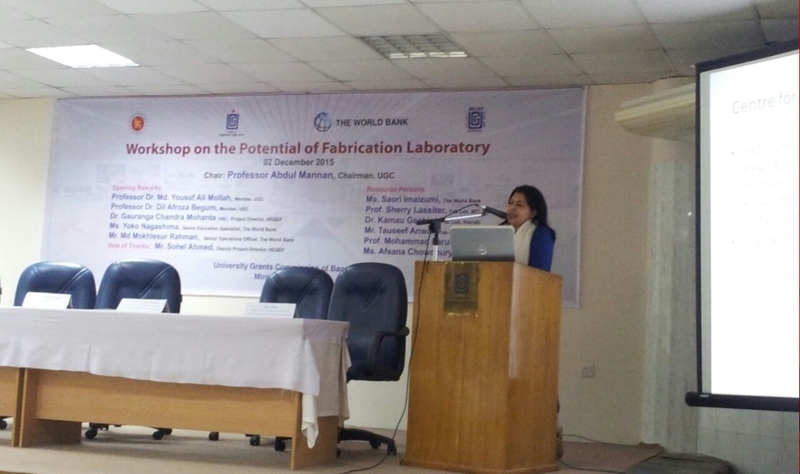 BRAC Universityâ€™s CED Program Manager Afshana Choudhury delivered a presentation in an International Workshop on Fab Lab with the title “Workshop on Potential of Fabrication Laboratory”. The presentation title was â€œHow Can Fab Lab Help Startup and Inspire Business Entrepreneurshipâ€. The workshop was organized under the Higher Education Quality Enhancement Project (HEQEP) undertaken by the Ministry of Education of the Government of Bangladesh, and implementing by the University Grants Commission of Bangladesh (UGC), with the assistance of the World Bank. The workshop was organized on 2 December 2015 at UGC Auditorium, Agargaon, Sher-e-Bangla Nagar, Dhaka. Two (2) resource persons, Ms Sherry Lassiter (Director, The Fab Foundation & MIT Fab Lab Program, Boston, USA) and Dr. Kamau Gachigi (Executive Director, Gearbox & Founder of Fab Lab, Nairobi) also spoke online at the workshop. Professor Abdul Mannan (Chairman, University Grants Commission of Bangladesh) presided over the Workshop. In her presentation, Afshana Choudhury emphasized on the importance of a fabrication laboratory that helps entrepreneurs design and fabricate product prototypes that can be commercially manufactured at a later stage of the businessâ€™s growth trajectory. She delineated that a fab lab can help social entrepreneurs and those working with the â€œBottom of Pyramidâ€ to readily access tools and equipment that can be utilized to come up with inexpensive products and offers. Precision tools and a scientific approach to fabrication can get rid of the trial and error methods that such entrepreneurs can ill-afford.